Put the egg whites into a spotlessly clean bowl and beat on full speed until quite stiffly beaten. Turn the speed of the mixer down and slowly add the sugar – one spoonful at a time. When all the sugar has been incorporated, add the corn flour and vinegar and give one final whisk on high speed. When ready the mixture should be glossy and when the bowl is turned upside down the mixture should remain stationary in the bowl. Line an oblong baking tray (13 x 9 inches) with parchment paper. 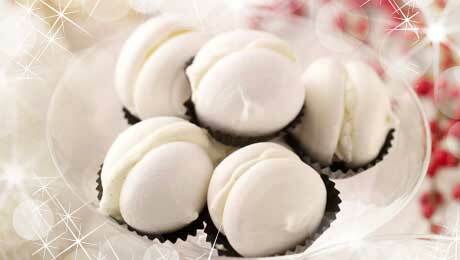 Using a piping bag, pipe the mini meringues to the size of a large walnut. Bake in the oven for 40 to 50 min until the meringue mixture is very firm to touch but still soft on the middle. I normally leave mine to cool in the oven with the door ajar. Keep in a tight container until needed. Serve either alone or with some whipped cream and/or fresh fruits.